Four barges broke free and sank on the Mississippi River near Winfield, Missouri. The motor vessel Julie White was pushing the barges, loaded with gravel, downstream as it approached the locks at Dam 25. The current pulled the barges free and pulled them onto the piers at the dam. The water rushed over the barges which quickly swamped and sank pinned against the piers. 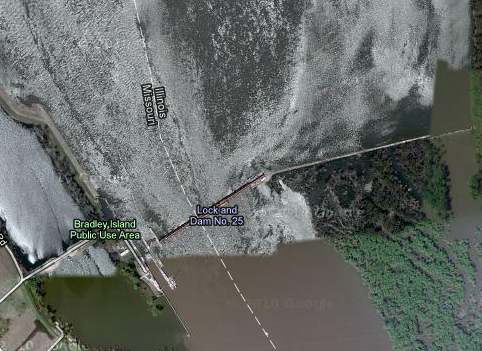 The current near the lock was strong as the dam was operating as ?open river?. An ?open river? means that all the dam?s gates were open to accomidate the high water level. Salvage plans are being made with the Corps of Engineers. The Coast Guard is conducting an investigation into the accident. U.S. Coast Guard photo by Petty Officer 2nd Class Dan Buress. 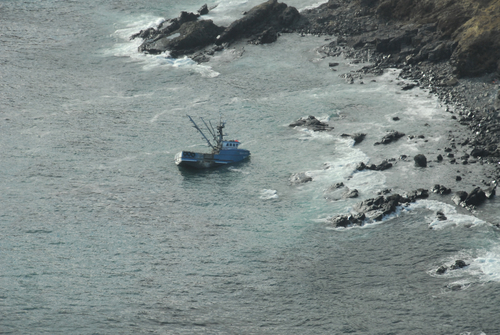 The 57-foot long fishing vessel Capt?n Andrew went aground off King Cove, Alaska. The vessel was in poor visibility and 10-knot winds went it grounded. Communication was poor and a distress message had to be relayed to the Coast Guard. Two fishing vessels, Golden Dawn and Just In Case, responded to the call along with the Coast Guard. The Just In Case, the sister ship of the Capt?n Andrew, was first on scene and rescued all 5 crewmen on board. The Capt?n Andrew is partially submerged with 2,000 gallons of diesel fuel. It is quite possible that some fuel has been spilled. A salvage company has been contracted to assess the situation. The Coast Guard is conducting an investigation into the accident.